As you age, you lose volume in the soft tissue of our most noticeable skin—mainly, in your face and hands. This results in a saggy, hollow or sunken appearance to the face, thin lips and a bony appearance to the hands. Dermal fillers can restore volume and improve wrinkling for a renewed, more youthful appearance. Treatments are a simple office procedure in the form of an injection that many find relatively painless thanks to the anesthesia included in most syringes. We always apply a numbing cream or topical anesthetic prior to your filler treatment to ensure your complete comfort. Our philosophy is to make sure that you feel you are in control, even if it means starting with just one syringe at a time. Dermal fillers like Belotero®, Restylane®, Perlane®, Radiesse® and Juvéderm™ are injected directly into a wrinkle to lift and improve the wrinkles at the sides of the mouth, underneath the eyes, between the eyebrows, the necklines and the fine lines above the lip. They are an excellent complement to Botox® and Dysport™ injections because they correct a different type of wrinkle. For example, the combination with Botox® improves the deep crease between the brows dramatically by stopping the movement, while Restylane fills the groove. Your face naturally loses volume and fat as you age, giving it a sunken, tired appearance. Fillers like Restylane®, Perlane®, Juvéderm™, Sculptura™ and Radiesse® are used to restore volume to the cheeks, temples and the jawline. Corrections can be done slowly for those seeking more subtle, gradual improvements—just a dab goes a long way. 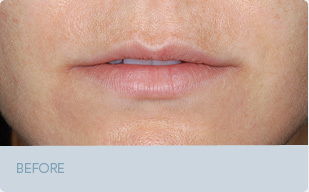 A similar technique is also used for Lip Restoration & Augmentation to give lips a natural, fuller look. Some people do not have the facial shape they desire, and in many cases this can be at least partly corrected with dermal fillers like Radiesse®, Sculptra™ or Restylane®. These fillers can be used to give the appearance of higher cheekbones, a stronger chin, or enhance a natural cleft in the chin. The hollows at the temples are often overlooked but can make a dramatic improvement in a very thin face. Hands show our age and are often neglected in the rejuvenation process. Injecting a filler such as Perlane® or Radiesse® can soften the bony and veiny appearance of the hand, leading to a more youthful appearance. One simple entry point with a needle is all that is needed. Which Dermal Filler is Best for You? Every filler is different and our providers are great at helping you choose the right one based on the wrinkle you want to correct. As with all our dermal filler treatments, we adhere to our philosophy that to achieve the best results that look and feel naturally beautiful, less is always more. These fillers are all composed of hyaluronic acid, a natural substance found in your body. With age, normal hyaluronic acid levels decrease, diminishing the skin’s youthful smoothness, firmness and elasticity. Hyaluronic acid is designed to supplement this loss and match your skin to effectively smooth wrinkles, sculpt lips or shape facial contours by drawing water to the site it was injected, resulting in a filling effect. Treatment takes about 30 minutes and results are visible immediately after. There are subtle differences between all the hyaluronic acid fillers. Your provider will help to decide which one is best for you during your consult. It is not unusual to have 2 different types, based on your goals. Radiesse®, is the first calcium hydroxylapatite injectable cohesive implant used for soft tissue augmentation. Calcium hydroxylapatite is a synthetic form of a mineral found in our bones and teeth that stimulates collagen production for a longer lasting effect. By stimulating your skin's depleted collagen, Radiesse® helps smooth out wrinkles and many scars. It can be used to treat the wrinkles between the nose and mouth (nasolabial folds) and the lines from the mouth to the chin known as “marionette lines". We love it for very deep folds as it provides more volume than hyaluronic acid fillers and allows for a better “fill” when lines are deep. It’s also great for creating higher cheekbones. Sculptura™ is used to counteract the loss of fat beneath the skin, a condition called lipoatrophy. It is injected into the deep dermis layer of the skin to improve the appearance of sunken cheeks, indentations and volume loss. The main component in Sculptura™ is poly lactic acid, a substance FDA approved for pan facial volume depletion. Clinical trials have shown that the benefits of Sculptra™ treatments last up to two years, as it stimulates your own collagen production around the filler, anchoring it in place for long-lasting results. The results are subtle and become more dramatic with each treatment. LaViv uses your body’s own collagen-making cells to rejuvenate the skin, thus eliminating any risk of allergic reaction. These cells, called fibroblasts, are taken from a small sample of the skin behind your ear and grown in an FDA-certified laboratory for three months. Once they’re ready, the fibroblasts are injected back into the problem areas in your skin, where they help your skin rebuild its very own collagen (for structure), elastin (for tautness), and hyaluronic acid (for thickness). Since laViv uses your body’s own healing resources to give skin a younger appearance, it is not an instant process. It can take three to six months to show results, but because those results are created by your own body, in many cases they can last for years without repeat treatment. *Barba Dermatology makes no express or implied warranties, representations or endorsements whatsoever with respect to the content, products and photos used throughout the site. Photo representation of procedures and services should not be deemed as expected results as each patient and procedure is unique and results will vary.